I knew that three companies control 90% of the global grain trade. That's the kind of stat you run across in my line of work. But I didn't know that two companies control more than 75% of all beer sales in the United States. Philip H. Howard put together this amazing graphic to illustrate it. If you go to this website, you can zoom in and discover which companies control which beer, as well as seeing a map of breweries per capita per state, just in case you're planning an American vacation. Heather, it includes only the biggest 13 companies. 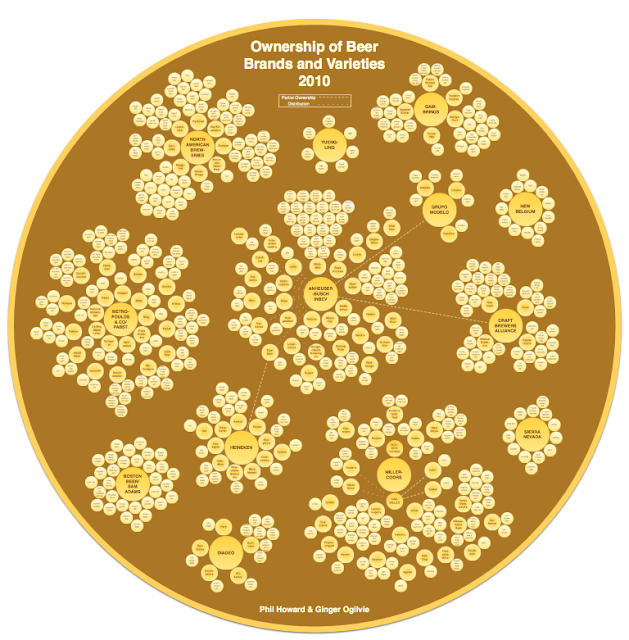 But if you follow the link, it has some information and graphics on the extent and the clustering of microbreweries.